Magic Nun. :) - You don't know me. i <3 nuns having fun! 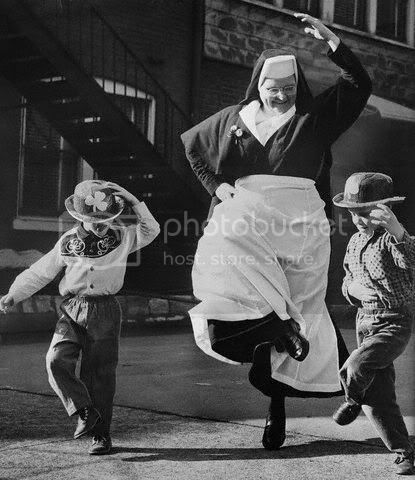 Early rehearsal photos remind us that Nunsense spent 60 years in preproduction. nun humour is always funny! -After Riverdance didn't work out, Sister Mary Flannigan met with her true calling: The Sisterhood of Perpetual Dance! -"Do it right, Patrick, or she'll get us with the ruler again!" "Leprechans Flee In Terror From Rampaging Sisters!!" hey, look--it's the truly square dance!! "If you take note, you'll see many abbys and cloisters traditionaly had fences or walls surounding them. This is not merely for decor but to keep their occupants from escaping and doing this...."
Awww, I don't have a caption but, it's just too adorable! Hi, the picture is beautiful. I'm wondering if you can tell me this sister's name and the religious community she belongs to. What kind of ministry did she do? Thanks. I really wish I knew. Isn't it an awesome picture? I just found it on google image search. There wasn't any information related to it. I would love to know her history too. i'm clueless for a caption, but that is a great picture!